But let's talk Halloween! One more time! 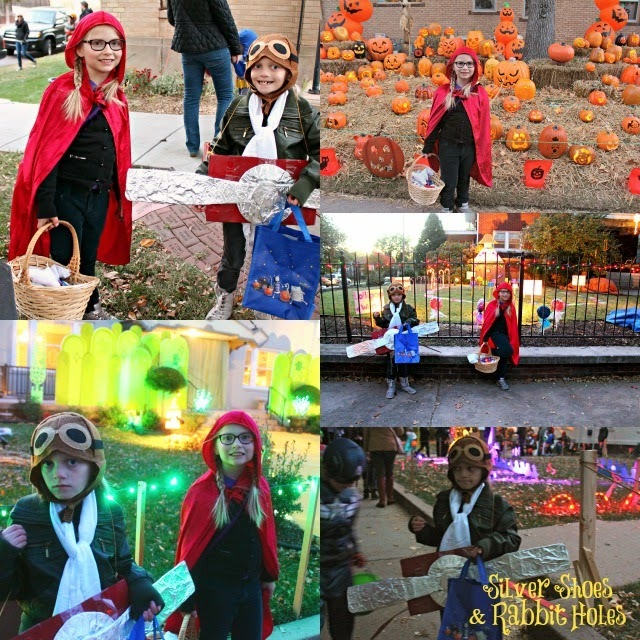 Little Red: Wolf Hunter and Amelia Earhart went trick-or-treating in our favorite neighborhood. Our own neighborhood was dark this year. 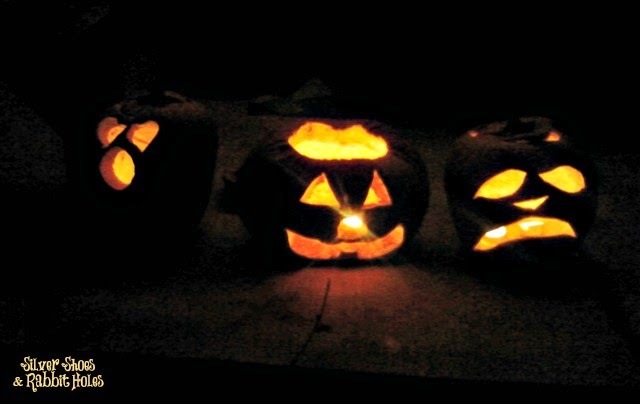 My husband only had three groups of trick-or-treaters. However, in nearby College Hill, there is a street that is blocked off every Halloween, with elaborate decorations and people passing out candy in driveways. The spectacle and atmosphere is so fun and fabulous. We started a couple blocks away, hitting some nearby houses and running into friends, then stopped by the Community Theatre to show off costumes to our theatre friends. Then we hit Halloween Street! We didn't linger. We had to head home, where my grandmother was waiting for us. 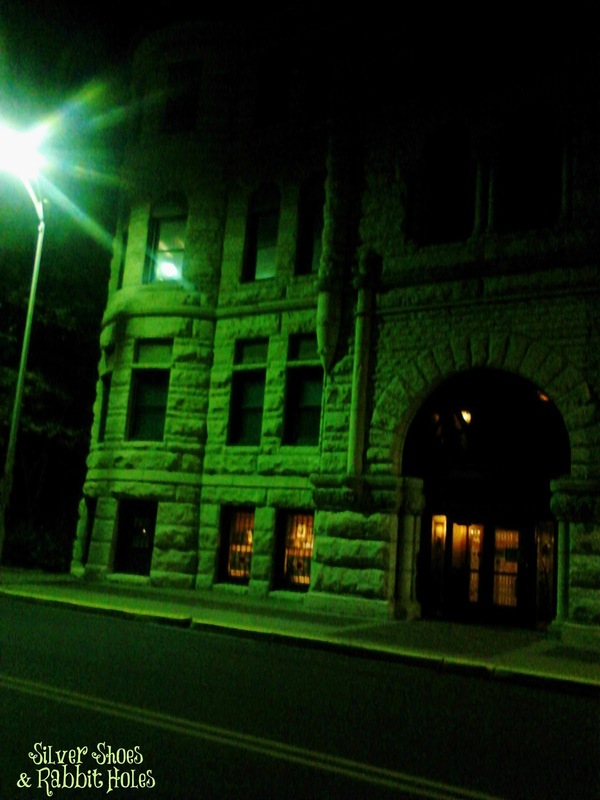 After picking her up, we headed to the Wichita-Sedgwick County Historical Museum for their annual Torchlight Tour. The Torchlight Tour is such a fun little event. The Coleman company provides little flashlights, and you explore most of the museum in the dark! 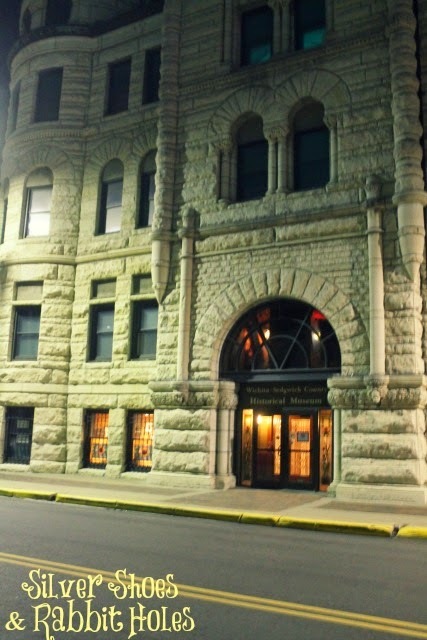 The museum is housed in the old City Building, designed by Proudfoot & Bird in the 1890s. Little Sis doesn't usually care for the old Otis elevator, preferring the grand stairs, but even she wouldn't complain about the elevator, as long as she could keep wearing her airplane! The girls' favorite spot, however, is the childhood exhibit. 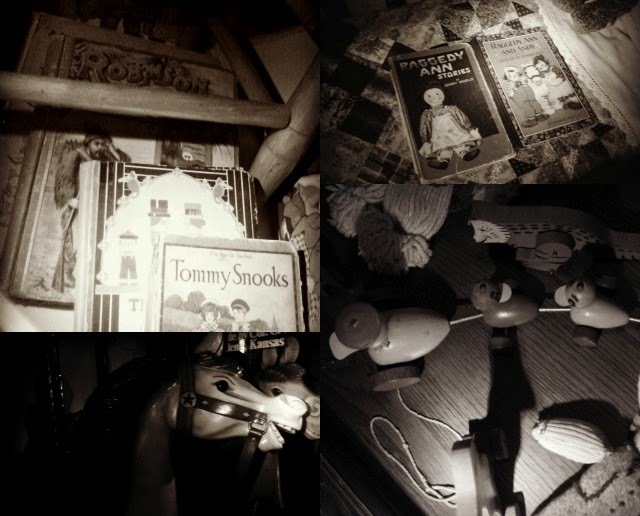 There's nothing like looking at antique toys and books in the dark, with flashlights. It's a bit creepy, like snooping in a very clean old attic. And there are dolls! 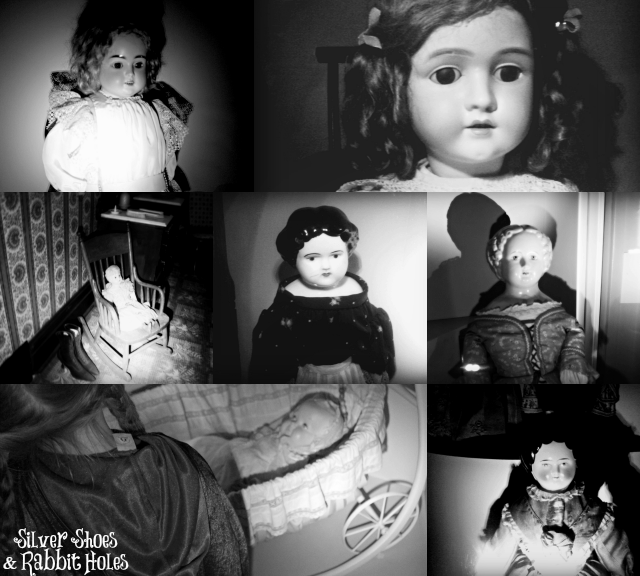 Lots of old dolls! I took one last picture with my phone, before hopping into the car. I don't know where the green light came from, but I love this picture! 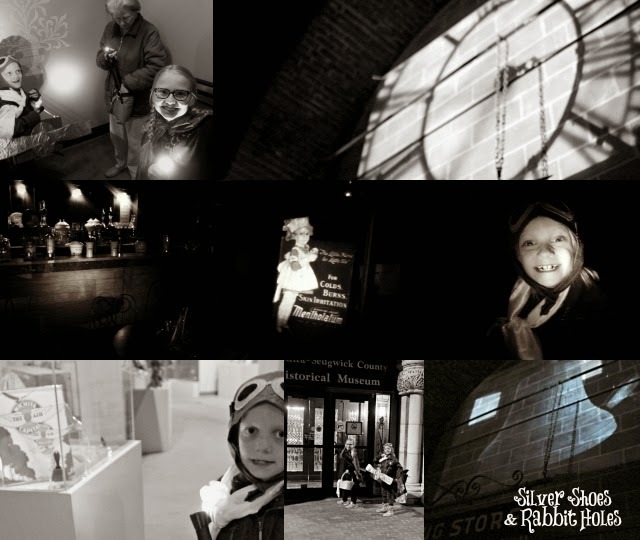 Thanks for spending your October with Silver Shoes & Rabbit Holes! I know I go overboard, but seriously, October through January is my favorite chunk of the year. I think you post the most during the month of October :) You sure went into full drive with the decorations, pumpkin carving and costumes (which I think were brilliant by the way)! thanks for sharing your wonderful pictures! 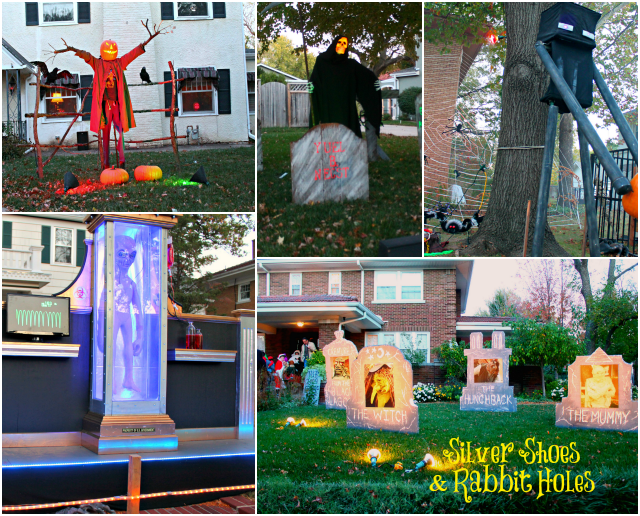 I don't see a lot of people enjoy Halloween but this is a great occasion to bring fun to the family! I like Halloween. :) I'll have a bit of a slow-down, then I'll be gearing up for Advent and Christmas. Overload, take two! 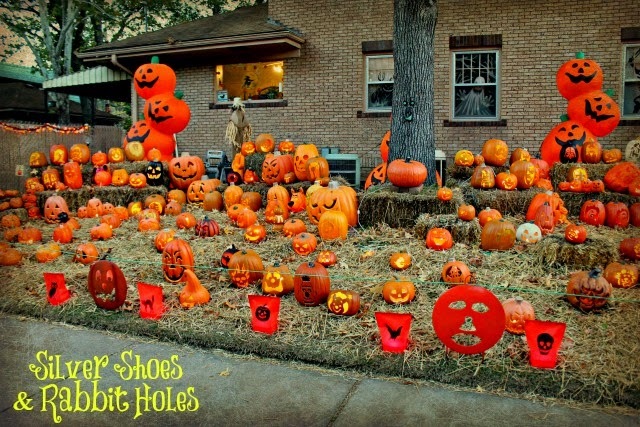 WOW - those Halloween displays! Amazing! And I love your description of that other place as a very clean attic in which to snoop around ha ha ha! Sounds like the girls has a grand time!!!! This street goes all out! 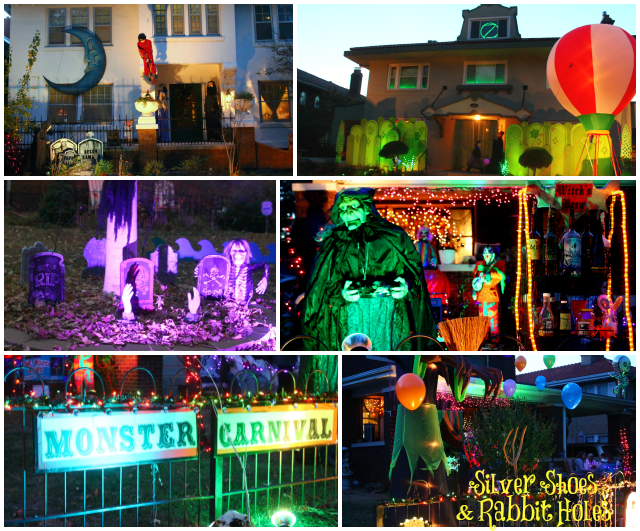 It's an old, well-to-do neighborhood, and this one street decided to be Halloween Street, and people set up the most elaborate displays. Then they block off the street, and the police set up "lost child stations," and it's just an all-around good time. Most of the people come from outside the neighborhood, but everyone is welcome. I think it's awesome that these people put so much work into giving the community a good time! I do love the historical museum. I was impressed how many people were there that night, including kids.